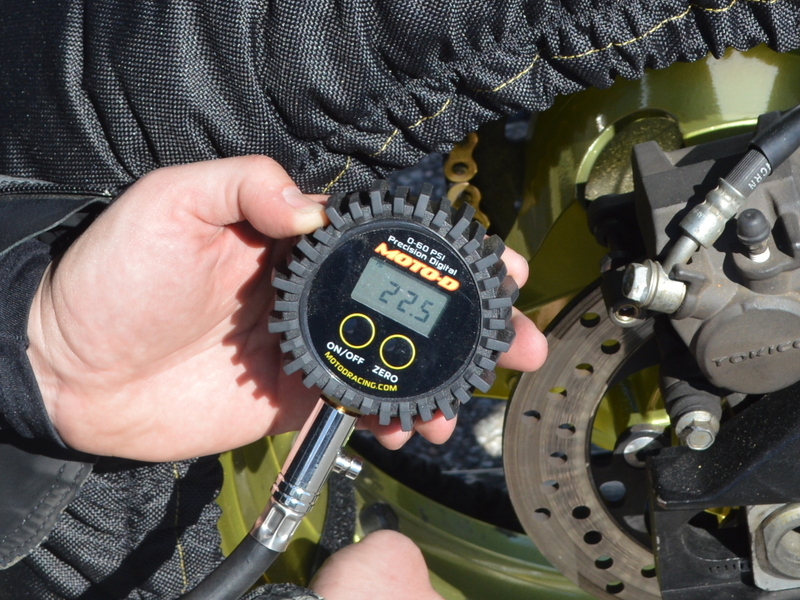 You'll get a lot of opinions on what tire pressure to run, but the correct tire pressure for you is not a matter of polling other rider's opinion. Here are the basics you'll need to decide for yourself. Start with the bike manufacturer's recommendation in the owners manual or under-seat sticker. This is the number they consider to be the best balance between handling, grip and tire wear. Further, if you're running alloy wheels on poor pavement, consider adding 2 psi to the recommended tire pressure just to reduce the likelihood of pothole damage. Just as you would for a car, increase the pressure 2 psi or so for sustained high speed operation (or 2-up riding) to reduce rolling friction and casing flexing. Check your tire pressure regularly as they say. In order to get optimum handling a tire has to get to its optimum temperature which is different for each brand of tire. Most of us don't have the equipment needed to measure tire temperature directly so we measure it indirectly by checking tire pressure since tire pressure increases with tire temperature. Tire temperature is important to know because too much flexing of the casing of an under-inflated tire for a given riding style and road will result in overheating resulting in less than optimum grip. Over-pressurizing a tire will reduce casing flexing and prevent the tire from getting up to the optimum operating temperature and performance again suffers. Sliding and spinning the tires also increase tire temperatures from friction heating. A technique for those wanting to get the most out of their tires on the street is to use the 10/20% rule. front or 20% on the rear, the rider should remove air from the tire. So for example, starting at a front tire pressure of 32.5 psi should bring you up to 36 psi hot. Once you obtain this pressure increase for a given rider, bike, tire, road and road temperature combination, check the tire pressure again while cold and record it for future reference. Each manufacturer is different. Each tire model is different. A tire design that runs cooler needs to run a lower pressure (2-3 psi front) to get up to optimum temperature. The rear tire runs hotter than the front tire, road and track. So the rear tire cold-to-hot increase is greater. Dropping air pressure has the additional side effect of scrubbing more rubber area. When I used the tire pressures recommended by Ducati (32.5F/36R) for my 916 on my favorite road, I got exactly 10/20% on a set of Bridgestone BT-012SS. So I guess I'm an average rider and the BT-012SS runs at an average operating temperature compared to other brands. same temperature (and pressure) that 35/39 psi gave you for the street. Don't even think about running these low track cold pressures on the street. number of thermal cycles. On the other hand, race tire on the street usually won't get up to the appropriate temperature for good performance. At street speeds, the race compound often won't perform as well as a street tire.